Iranian news agency claims Israeli weapons and ammunition were intercepted inside the Saudi embassy in the Yemeni capital. A large shipment of Israeli weapons and ammunition were intercepted inside the Saudi embassy in the Yemeni capital of Sanaa, the Israel Hayom newspaper reported Sunday, citing the Iranian Fars news agency. 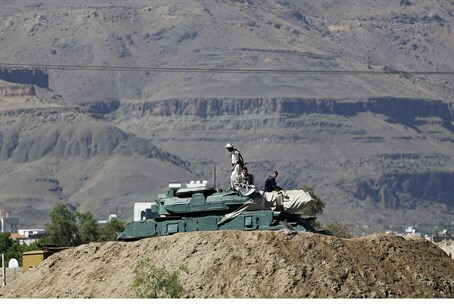 According to the report, the weapons were discovered when Iran-backed rebel Houthi forces gained control of the compound, defeating the Yemeni security forces guarding the embassy. The Houthis claimed that they had also seized documents proving that the United States planned to establish a military base in Saudi Arabia to monitor the Bab el-Mandeb strait (between the Gulf of Aden and the Red Sea) "in order to protect American interests and protect Israel," the report stated. The Houthis further claimed that Riyadh had asked Israel to send advanced weapons to help forces loyal to Yemeni president Abed Rabbo Mansour Hadi, who was forced to flee the country in late March when the Houthis began marching on Aden, before capturing central parts of the city. According to Israel Hayom, the Houthis seized control over the Saudi embassy in Yemen as vengeance for the repeated attacks on populated areas and hospitals alongside strikes on military bases. Sunday's Fars report is not the first time that reports of Israeli weapons being used in the fighting in Yemen have surfaced. In April, a senior Yemeni army official told the Iranian news agency that "the Saudis are using Israeli weapons to launch airstrikes in Yemen." In fact, Arab countries accusing Israel of being involved in their conflicts is nothing new. Syrian authorities have in the past claimed to have discovered Israeli equipment in the country. In 2012, Syrian security forces claimed to have captured an “armed gang” whose members possessed weapons manufactured in Israel and in the United States. The weapons, which were allegedly seized in a neighborhood in the city of Homs, were described as “high-quality weapons" and included sniper rifles, mortars, missiles and other explosives. Several months earlier Syria also claimed it found a Peugeot 404 car loaded with Israeli weapons, explosive devices, ammunition and stolen military uniforms.